Rome- Saint-Pierre-Bel appartement avec vieuw unique! NOS PRIX: À partir de €100 à €190 (selon la saison et le nombre de personnes, max.6). CONTACTER NOUS POUR UN DEVIS et LAST MINUTE! Cette propriété est située directement en face de la place Saint-Pierre, par les fenêtres, vous pourrez admirer la plus belle coupole dans le monde! L'appartement vient d'être rénové avec des finitions de haute qualité. Peut accueillir 6 personnes, composé d'une grande chambre à coucher avec lit à baldaquin . La deuxième chambre dispose d'une salle de bains privative et un vue magnifique, surtout la nuit, lorsque le «Dôme» est allumé! Dans la salle de séjour, rideaux blancs spacieuses et romantiques, séparent la salle à manger du salon où le canapé en fer forgé est transformé en deux confortables lits . Une des salles de bains possède un grand douche de 80x120cm, sol en marbre jaune et un beau miroir antique. La cuisine donnant sur le dôme, est super-équipée, avec lave-vaisselle, lave-linge, four et tout ce dont vous pourriez avoir besoin. This was a nice apartment right next to the Vatican. We walked everywhere except for a few cabs. Like others have said, some of the beds are a bit hard (in my experience, most apartments in Italy have the same issue) and the wifi can be slow, but it was a nice stay in a clean, well-equipped apartment. 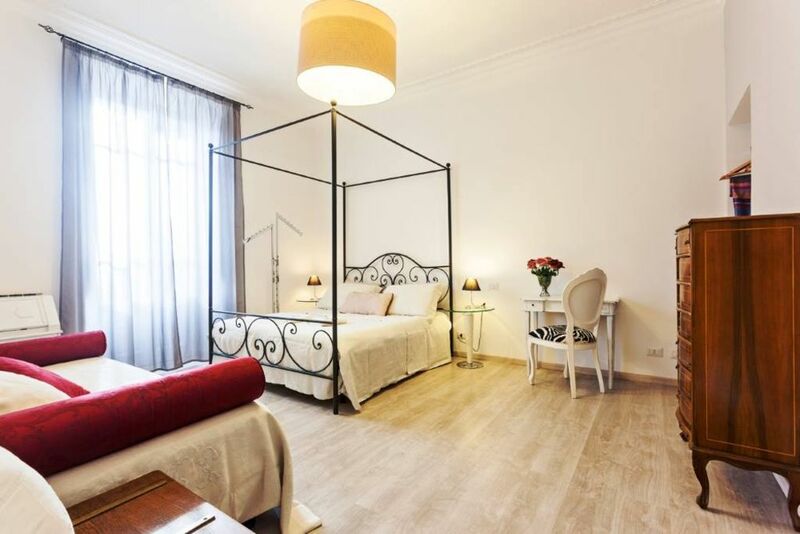 Nice and comfortable apartment in a quiet and peaceful area of Rome. Close to the Vatican, to the bus stop and to the metro, and also near various shops and restaurants. The beds are extremely hard, do not expect a good night sleep to begin with but if you are in the front room the road noise is extremely loud. The front bedroom A/C worked very well, but the bigger bedroom A/C did not cool well and the expectation is to turn the A/C off when you are not in the apartment, so it takes a while to cool. The living/breakfast area do not have an A/C unit so only the bedrooms are Air Conditioned. Wi/Fi is mediocre at best, so don't expect to stream on multiple devices. Highly suggest that they provide more than one set of towels per person when you have booked for 6 nights. Just as a tip, if you are planning on doing all the sights in Rome, this location is close to the bus route but we found that the metro is much more dependable in Rome. This location is a 15 minute walk to the metro on the other side of the Vatican. So when we return to Rome, we will stay somewhere closer to a metro stop. There is a mini-market right downstairs which is handy if you need anything simple and a number of restaurants close by. The best restaurants are about a 10 to 15 minute walk or bus ride. Host very responsive and nice; she helped us with early check-in (thank you), and provided a wealth of info about everything we needed for our stay. The property was great. I could not have asked for more! The property was perfect; it is clean and well maintained. It’s in an ideal location- close to sites of interest without being in the most congested part of town. The bus is right outside of the apartment which made life so easy. Not to mention, it’s steps away from The Vatican! Alessia and Stefania are gracious hosts and were very helpful. I totally recommend this place! The Best Location for The Vatican! We loved this location. Right across from The Vatican. You can see St Peter’s Dome from the windows. Great restaurants and coffee shops right on the block. Plenty of space for our family. Anything you need, just ask and you get a quick reply. Highly recommended if you are looking for the Vatican area! Check in du H.13:00 - H.20:00. Est possible le check in de soir 20h00-11h00 (€30). Check out dans le 10h00.